In the historic heart of one of America's iconic cities, the Louis G. Gregory Baha'i Museum is a unique haven of serenity. The Louis G. Gregory Baha’i Museum is located in a modest, two-story structure—an example of the classic Charleston “single house,” with a long side porch and a narrow façade facing the street—that Mr. Gregory's stepfather built for his family in the mid-1880s. More than a century later, it had long since passed from the family’s hands and was in need of major repairs. In 1988 a local Baha'i attending a real estate auction recognized the address and bid on the property—even though he alone did not have the funds to purchase it. In Charleston, around South Carolina, and across the nation, the Baha'i community rallied to the cause, raising the money to purchase and eventually renovate the house. At the same time the local community accumulated a collection of documents, photographs, and artifacts relating to Mr. Gregory’s life and career. Curtis Franks, curator at the Avery Research Center for African American History and Culture, part of the College of Charleston, helped prepare the community’s collection for display. Phillip Simmons (1912-2009), a master blacksmith and noted keeper of Charleston’s distinctive wrought-iron tradition, crafted the sign. The Louis G. Gregory Baha'i Museum opened with a public celebration in 2003. In a virtual city of museums, it was the first one dedicated to the life of a single individual. The Museum is owned and operated by the local administrative board of the Baha’i community of Charleston. Tours are offered by a dedicated team of volunteers. 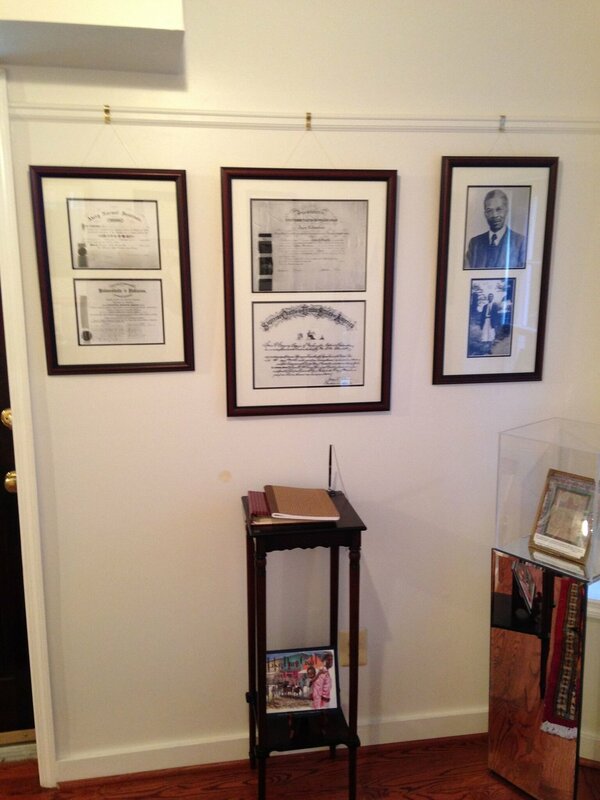 The Museum's collections include a portrait of Louis Gregory; reproductions of his high school, college, and law school diplomas; a number of historic photographs; original editions of some of Mr. Gregory's published works; examples of his correspondence with notable African Americans and with Baha'i leaders; and some of Mr. Gregory's personal effects. Tours are available by appointment and Sundays at 12 noon, and we encourage you to schedule in advance. The Museum also hosts a variety of devotional (Sundays at 11 a.m.) and educational activities. Please call (843) 779-9634 for information or to schedule a tour. © 2017 Spiritual Assembly of the Baha'is of Charleston, Inc.